RUTH MCHUGH'S striking new photographic exhibition, Spectres of Modernity, opens on Monday July 11 in the NUI Galway gallery, as part of Galway International Arts Festival. The exhibition captures the final days of the Ballymun high-rise tenement towers and meditates on their inception in the heady days of 1967. This is an exhibition that fuses architecture, place, truth and fiction in relation to the ephemeral idea of modernity. Formerly a member of Artspace, Ruth has been based in Dublin for close to 20 years, reversing the familiar Galway pattern of artists moving here from outside for a visit and then staying. “At the time I left Galway there wasn’t a supportive attitude to culture here,” she tells me over an afternoon chat. “At the time, living as an artist here was really hard. Ruth describes how her work has evolved over the past decade; “It’s kind of being roundabout, I seem to have spent a lot of time being a round peg trying to fit into square holes!” she says with a laugh. “I did a show in Galway Arts Centre with photographs; I was using a very basic DSL camera at the time, and trying to get the best shot just using available light. That’s developed over years so that I am now known as a photographer in Dublin whereas in Galway I am still known as a painter. Ruth’s introduction to the towers followed from her beginning to work with Ballymun Communications. She steadily became absorbed in their unfolding story. “When I first went there I thought the towers were already gone,” she tells me. “One of my colleagues brought me up to where he used to live and it was now just this patch of green grass. I couldn’t get any sense of what the place once had been, it had completely gone, I couldn’t believe this is where flats had been. Then he brought me over to some that were still there and after that I started visiting them. There was nobody there except for this one homeless guy who everyone liked and who I found out used to play for West Bromwich Albion. 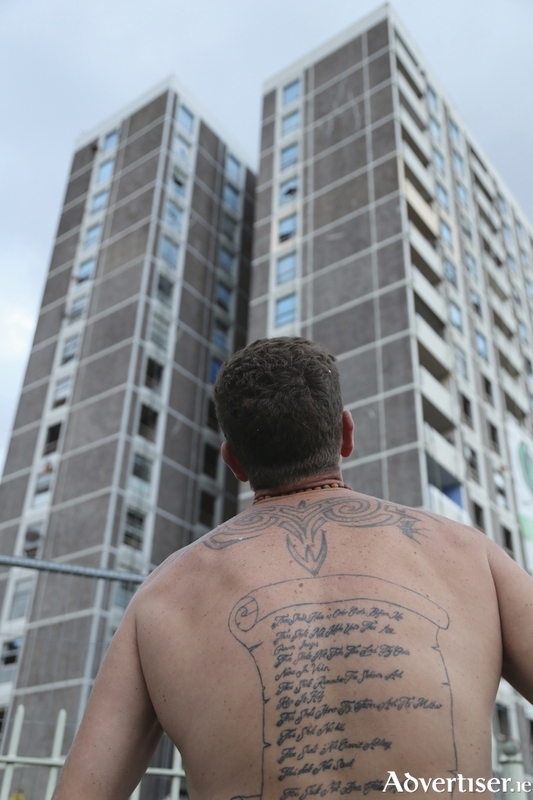 McHugh’s images of Ballymun plug into the many resonances that arise from the flats first being occupied in 1967. “That was the ‘summer of love’ which was an extraordinary year for music, you had the Beatles, the Doors, and the Rolling Stones, all to the fore," she says. "I had this vision of a utopian sixties, Carnaby Street, and so on. I started collecting clothes from the era for images in the exhibition and a lot of them are back in fashion again now, interestingly. "I was also reading Tom Wolfe and From Bauhaus to Our House and Le Corbusier a lot of stuff about cities, informing myself a lot about that time. The flats were built as a utopian solution to urban living, they represented this whole new idea of how people could live, an ideal architecture. 1967 was also the year the ROSC exhibition was held which signalled the arrival of modern art in Ireland. I put all these things together in the exhibition. “It also references the fact I am an outsider, I don’t really know what it was like there. I have a film as part of the exhibition that has interviews with people that bring you in and talk about the buildings. Lots of the people who lived there really loved being there, people who talked to me were sad about going.